Most kids love to play in the water, and my Caity and Adie are no exception. They enjoy splashing and soaking and getting all wet. It also gets more fun when they bring their toys with them in the water – an inflatable lifebuoy or plastic ducky. 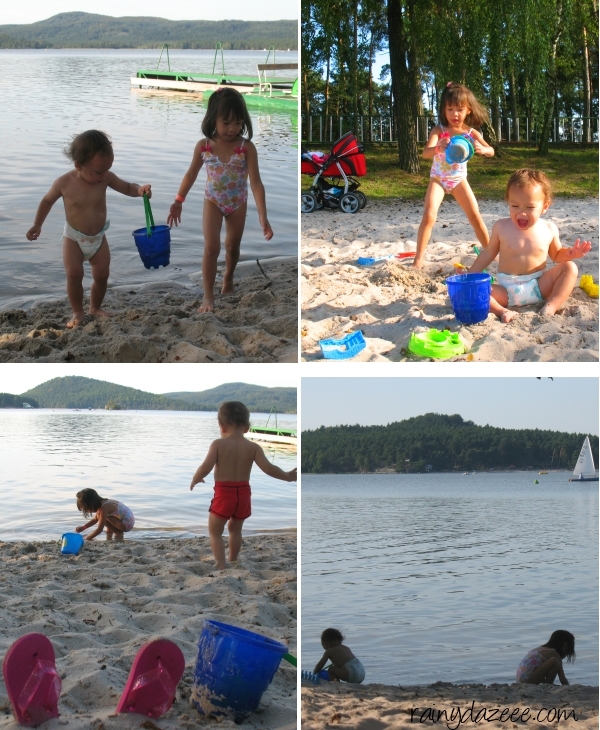 They also love building sandcastles and playing with the sand by the sea shore. Caity has been spending time in school the whole day since yesterday. For kids staying in school until the afternoon, they have a nap time after lunch. We always pick her up after lunch. When I put her to sleep last night, she babbled all about her sleeping experience there. Then she suddenly pulled me close to her. I thought she wanted to whisper something but she said, “And Mama… I want to kiss you.” It wasn’t just one, but plenty! I drowned in her kisses! hahaha She must have missed me much. Eyyyyyy! Last week my father-in-law arrived from his three-week Asian tour with three of his friends. 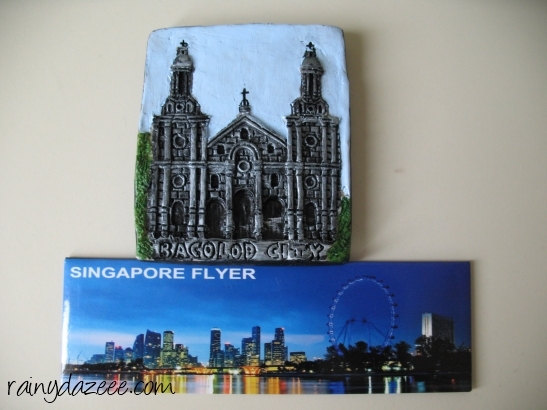 I got souvenir magnets from him to add to my collection and some goodies from Negros! They went to Singapore, Philippines and Bali, Indonesia. Their Philippine stint included a tour in Taal Lake, Tagaytay, Corregidor, Intramuros and other parts of Manila and Makati. Sheeeshh, I haven’t even been those places yet! We found a travel agent that took very good care of them and even went out of his way to make their stay a pleasant one. After their stay in Manila, they transferred to Negros to visit my parents. It’s the second time for them to see each other. The first time was when my parents came to Prague to see us. Mom prepared a well-planned itinerary for them; tour in the Victorias Milling Company to see how sugar is made, they attended the reenactment of the Cinco de Noviembre battle in Silay where their presence was recognized by the Mayor, they visited the Negros Museum, saw the Ruins, trekked the hilly Mambukal terrain up to the 7th falls, went swimming in Pacific Shores, etc. etc. 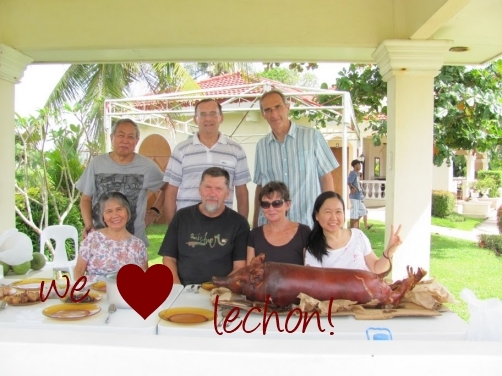 It was a fully-packed and very busy 4 days for them in Negros and of course, aside from seeing the sights, my family made sure that they get to taste the famous delicious Negros cuisine and Filipino hospitality at its best. 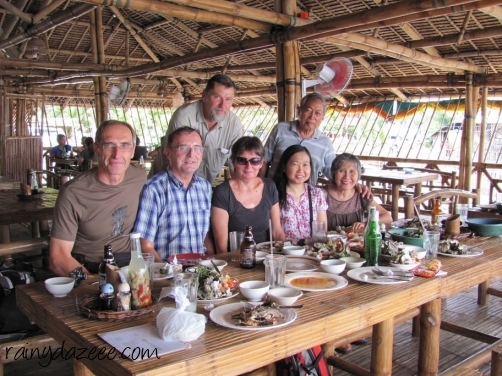 I am glad our Czech guests enjoyed their stay in the Philippines. 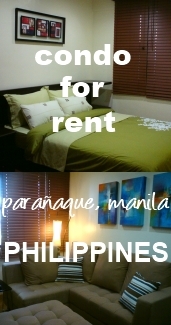 I’m posting some of their pics courtesy of mah sistah (Happy Steps Travel Blog)! Posing in front of their cottage at Mambukal Mountain Resort. My two dads. (: At home, during their farewell lunch. 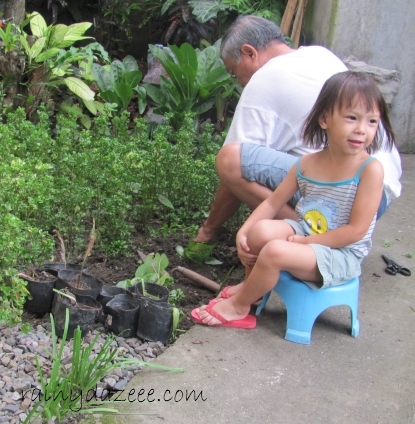 As I was browsing through the files of our family pics, I came across Caity’s pictures when she was “gardening with her papa Ed” (my dad). I then remember my Dad, now a 75-year old, who likes to do gardening, play the organ, watch TV or enjoy the computer reading news, playing solitaire game or browsing through the videos or photos of his grandchildren, in Prague or in Finland. Sometimes he chats with his children through YM too. Just yesterday, I was chatting with him. Caity gardening with Papa Ed. As a mechanical engineer, one of his favorite pastimes is also tinkering with the van, trying to do little maintenance here and there, with his box of bearings, gears, screws and nuts. It’s like the kitchen is to the woman as the vehicle is to the man. Yeah, I think it is inherent for a man to place the car or whatever vehicle he owns close to his heart, don’t you think so? Hmmm.. okay, back to browsing and organizing our pictures. Have a good day everyone! A friend who recently saw Caity’s picture commented that I already have a little lady. Well, in my eyes, she’s still a child, because she really is! She’s only three years old! I don’t want to rush her into growing up. Childhood will take years but years do fly very fast! There will come a time in the future that she won’t be needing me anymore. She’d prefer to hang out with her friends than me; she’d rather spend her weekends with her boyfriend. Yay! It is possible. Soon she will be choosing her own clothes (she’s even starting to do that), she’d be worrying which to wear over a bunch of prom dresses and other girly matters. Uh, the thought already makes me sad. 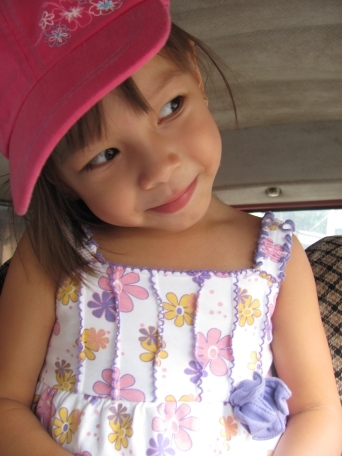 That’s why I am savoring each moment I am with her now – now when she still yearns for mama.